The reason why I stick a NZ beef is due to my opinion as I mentioned that U.S. Beef and Australian Beef have a concern in a production process. They seem to use Hormone Growth Promotants, Antibiotics and Animal Fats. Those countries say that no one haven't proved causal relationships because there are a few historical data and clinical results. 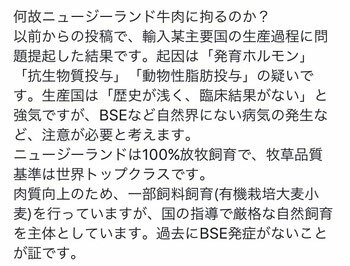 However, we should be care of a new sickness as BSE which is not a natural phenomenon. New Zealand cattle grow with 100% grazing. The quality of grasses in NZ keeps a high position in the world. In some cases, they use a few grains as a barley and wheat to improve a meat quality, however, the country policy guides to raise cattle naturally. That policy correctness was proved by there being a no sickness like BSE. 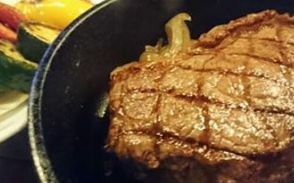 The reason why NZ Beefs were imported less than others is due to a favorite of Japanese who likes marbling beef and a low price of American Beef. 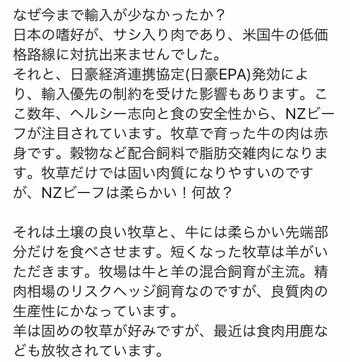 And for another reason, Japan-Australia EPA reduced NZ beef import. 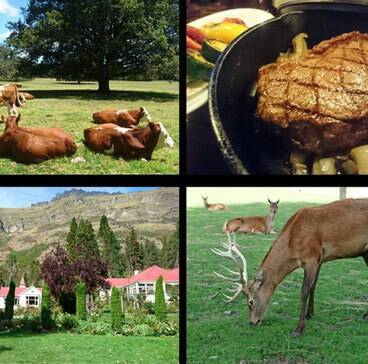 But in a recent year, for a improvement of awareness for a healthy and safety of foods, NZ Beef is focused. The cattle grazing in pastures has a lean meat. If those cattle have compound feeds with grains, they will have a marbling meat. But if cattle grows only by grasses, those meats are going to be suet, however, NZ Beef is tender. Why? It come from a grass with rich soil, cattle eat soft parts of top edge of it, and a rest hard one, for sheep. It's important to raise cattle and sheep in a same pasture. It came up as a risk hedge system for a meat market price volatility, but also effects a productivity for producing high quality meats. Sheep like hard grasses and a recent year, deer also raise in a same pasture. It seems that tender meats came from a stress free raising with a less human influence. A dairy farmer has a high sense to keep a well environment for raising, and put flowers and trees of NZ original around a pasture to develop a healing landscape. I wonder whether cattle can understand that effect or not. Provably, it has an influence from Gardening in England. I feel that taste good with cattle's face relaxed.